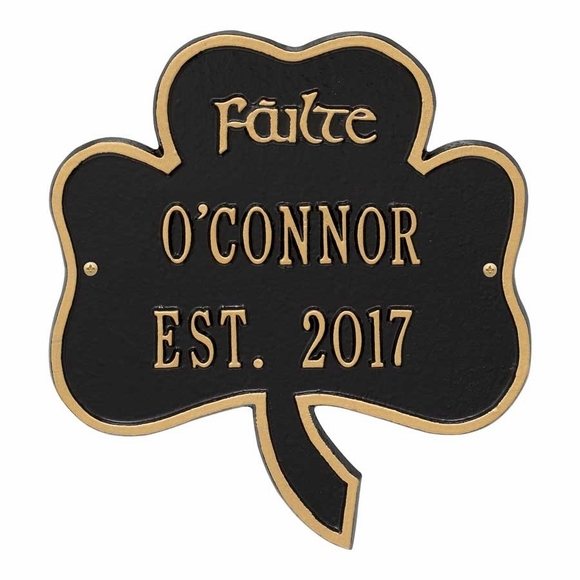 Personalized Failte Shamrock Welcome Plaque - - personalized with a family name and the year it was established. Welcome guests to your home with an expression of Irish hospitality. Wall mount 11.25"W x 10"H. Made in USA. The shamrock leaves represent faith, hope, and love. Handcrafted Irish theme aluminum address sign for indoor or outdoor use. The word "Failte" at the top, the Celtic word for "Welcome," is standard on this sign. You can set up your sign as shown in the samples with a name on Line 1 and EST. year on Line 2. OR you can supply any other wording that meets your specific needs. Line 1 holds up to twelve (12) 1.25" characters. Line 2 also holds twelve (12) 1.25" characters. Please be sure to type your entries for Lines 1 and 2 exactly as you want them to appear, including all spaces and punctuation, in the corresponding input boxes. Colors: AC antique copper, BG black with gold characters, GG green with gold characters , OG bronze with gold characters. Large image shown in black with gold characters. Dimensions: 10"W x 11.25"H x 0.375". Personalized shamrock shape Family Name sign.